Calcifer is a fire demon and in the English dubbed version of the movie, is voiced by Billy Crystal (aka. Mike Wazawoski from Monsters, Inc., Miracle Max from Princess Bride or Harry from When Harry Met Sally <= my favorite movie of all time!). Incredibly cute and boisterous at times, he is one of the most memorable characters of the movie. The meringue recipe I’m sharing is delicious and can be flavored with different extract or add-ins, but this time I chose to keep it simple by tinting it in different colors and shaping it so it has a flame-like body. Stirring the gel food coloring does deflate the meringue a bit and spooning it onto the parchment paper in layered dollops seems to produce a few cracks in the meringue. This is just a theory because I’ve made this recipe before and it produces very white, no-crack meringues when piped into little shapes. Divide batter evenly into three separate bowls, coloring each portion red, yellow and orange. Taking two spoons, place a dollop of the yellow batter and layer it with the orange and then the red. Repeat until all the meringue batter is used. Bake about 2-3 hours until they are crisp and hollow. 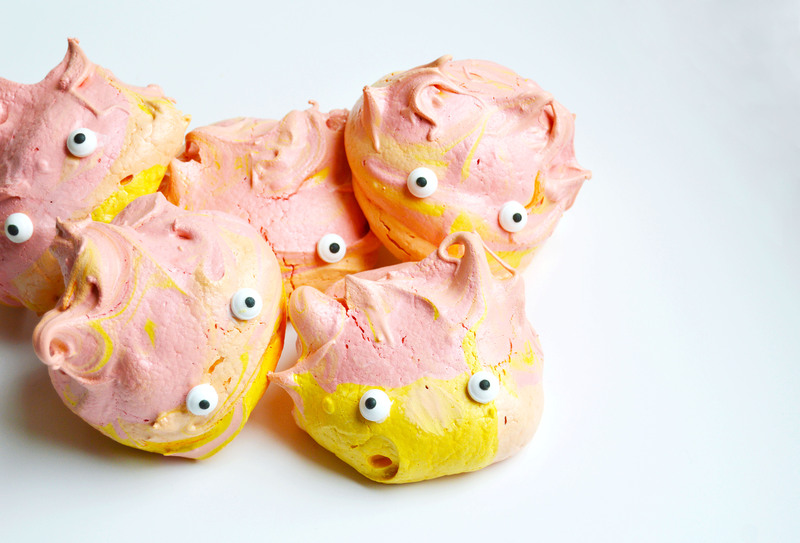 When meringues are completely cool and dry, melt two white candy melt wafers and dot behind two eyes and place the eyes onto the bottom third of Calcifer’s face. 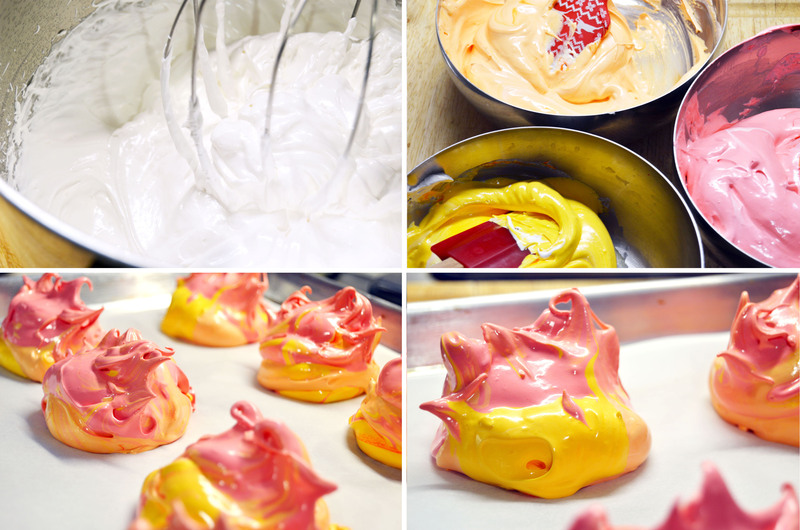 Let candy melt set and you are now ready to enjoy your meringue. Meringue recipe adapted from Ottolenghi: The Cookbook. 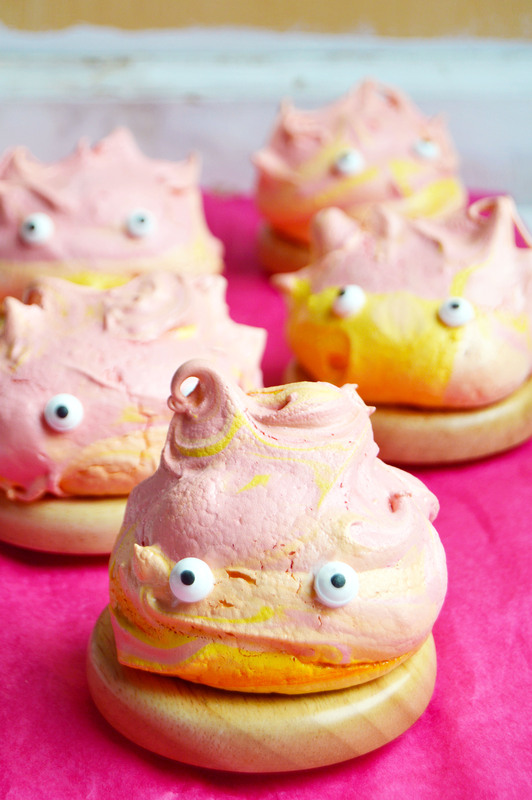 This entry was posted in Cookies, Desserts, Disney, Geek/Nerd Culture, Meringue, Vanilla and tagged anime, calcifer, Cookies, disney, geek, howl's moving castle, meringues, nerd, vanilla. Bookmark the permalink. I love these, they’re so so cute! This is creative and so cute! Too stinking cute!! You make the coolest things! 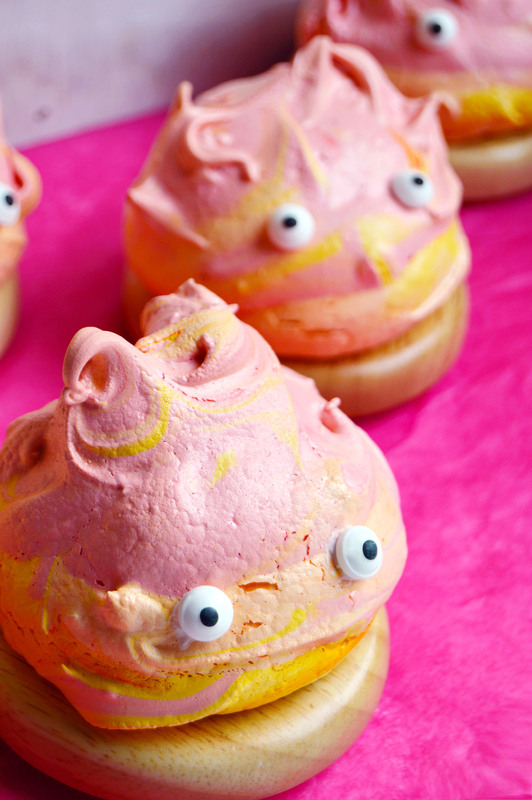 I just tried this recipe-totally adorable. You mentioned you had trouble with cracking…since I didn’t have superfine sugar I just threw it in the blender and then right into the meringue once it got foamy (without heating it in the oven) and mine didn’t crack.